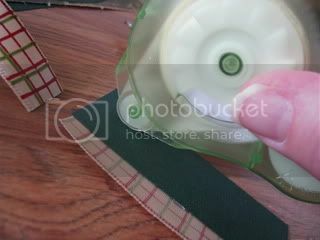 I've used Glue Dots adhesives for making cards and scrapbook pages, and I've found them to be super-convenient to use. But when TwitterMoms issued a Summer Bonding Project challenge, I was looking for a different application. We had an empty cookie tin (about 3-1/2" tall and 4" in diameter) that I'd been trying to think of a way to repurpose. 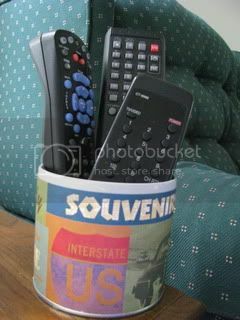 As I glanced over at the endtable in our family room, I decided that I'd turn the tin into a container to hold the three remote controls that tend to get lost clutter up the table. The MINI GLUE DOTS DOT N' GO dispenser made it very easy to apply several Glue Dots down each side. To keep the remotes from clunking too much in the bottom of the container, I lined the inside. I decided to use the corrogated disk that came in the cookie tin; the cookies were in a foil bag, so the paper was very clean. I secured it with Craft Glue Dots. I cut a strip of cardstock to line the inside. Again, it wasn't quite long enough to reach all the way around, so I filled in the space with another strip of cardstock. Finally, I traced the bottom of the tin onto cardstock and cut out a circle for the bottom (outside) of the tin, so it won't scratch the table. (If I had a sheet of felt, I would have used that instead.) 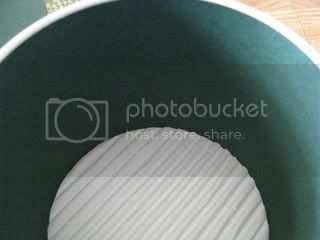 I adhered that with Mini Glue Dots, which was a little tricky on the rim of the tin. However, the Glue Dots are sticky enough that I know the paper is secure. Disclosure: I wrote this blog post while participating in the TwitterMoms and Glue Dots blogging contest to be eligible to receive a $30 gift card. For more information on how you can participate, click here. Neat little project! I love useful stuff. :) Thanks for the visit today! Melissa, Thanks so much for stopping by my blog today! You have such cute ideas. I'm not creative at all, but I love your ideas. You are so crafty :). I love glue dots too! I love this idea! What a great example of turning trash into treasure! Check you out girl!!! LOVE this idea!! you rock! I think this looks cute! Great Job! Nice idea! Now you have me thinking how we need something for our phones, the always end up here and there.